At Bracknell Methodist church you will find a variety of different activities suitable for all ages of children. Beaver Scouts are boys and girls usually aged between six and eight years old They belong to the first and youngest section of the Scouting family. Easily recognised by their distinctive turquoise sweatshirts, the emphasis is on meeting together to make friends and to take part in a variety of organised activities from team games to crafts. You can find more about their activities by visiting their website. Cub Scouts belong to the second section of the scouting family and are easily recognised by their dark green uniform. Like Beavers there are a wide range of indoor and outdoor activities, for which you can earn badges. Throughout the year there will also be opportunities to go camping which will mean sleeping in a tent and doing loads of outdoor activities. The Scout section builds on the skills developed in Beavers and Cubs, they are encouraged to take part in a wide range of activities as part of their active programme. This helps them to find out about the world in which they live and allows them to discover their own abilities, creative talents and the importance of keeping fit. Scouts are encouraged to take part in both traditional and modern Scouting skills, from camping and survival through to abseiling and climbing. The troop meets weekly during school terms from 7.30pm to 9pm on Monday evenings in the church hall. Explorer Scouts are young people, usually aged between 14 and 18 years old. Explorers are encouraged to organise, plan and run a range of indoor and outdoor activities under the general supervision of their leaders. Explorers are also encouraged to provide assistance to other sections. The Unit meets weekly during school terms from 7.30pm to 9.30pm on Monday evenings in the church hall. If you want to take part in the fun of Scouting (beaver, cub, scout, explorer) or as an Adult Leader, please contact - Telephone: 01344 424317. Rainbows belong to the first and youngest section of the Guiding family. They usually meet once a week and take part in many activities as part of their programme called the Rainbow Jigsaw: Look, Learn, Laugh and Love. Everything a Rainbow does helps them to build self-confidence and team spirit, like singing, dancing and playing games. Crafts are also encouraged, some examples would be; decorating biscuits, making lavender bags, painting and making bookmarks. Brownies belong to a Pack and work in small groups called Sixes. This gives each girl a group of ready-made friends to take care of her. It also makes her feel that she belongs to something special. 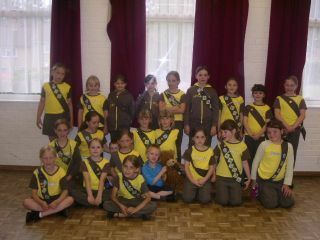 The Brownie programme is called the Brownie Adventure. The name reflects the excitement and fun it offers each Brownie and her Leaders.They take part in indoor and outdoor activities that challenge them to do their best. Their meetings are action-packed and full of challenges, games and activities, usually ones that the Brownies have suggested themselves. Brownies have fun! The Trefoil Guild is for senior Girl Guides and meets on the 3rd Wednesday of each month.